A lot of my time last summer was spent getting our oldest daughter ready to go to college. Audrey had an entire list, organized by categories (she’s a very organized person for someone her age), of items she felt we needed to purchase for her dorm. Well…never having been through this before (except as an actual college student myself), I wasn’t exactly sure about some of the items. It’s been a year now since we embarked on our numerous shopping trips, and I thought I’d share some of what I learned along the way…the DOS and DON’TS of college shopping! DO purchase the top of the line memory foam mattress topper. It truly is worth the money! 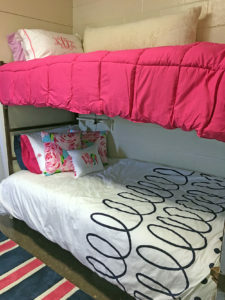 I mean…have you ever slept on those thin, hard dorm mattresses? Speaking of bedding, DON’T wait to order your comforter. Audrey didn’t find out her roommate assignment until mid-July, and by then most of her choices were on backorder. DO purchase sheets that fit those XL twin mattresses. DO take advantage of the PACK AND HOLD service offered at Bed Bath & Beyond. This was a real lifesaver for us, considering how far away she went for college. It works like this…you visit your local BB&B and choose the items you want. Those items are set aside at the store of your choice to pick up at a later date. Our car was already packed so tight with other belongings that it was so nice to not transport everything from Ohio to South Carolina. DON’T forget to wash the new towels, sheets, washcloths, and blankets before you arrive on campus! DON’T feel like a safe is necessary. We were instructed to purchase one, but I discovered that Audrey rarely used it. However, she didn’t take expensive jewelry or her good camera to college. She usually had her credit cards and laptop with her. 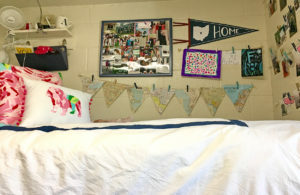 She attends a small college, and the dorm rooms automatically close and lock when one leaves. My advice is to use your judgement…you may feel differently, given your own situation. 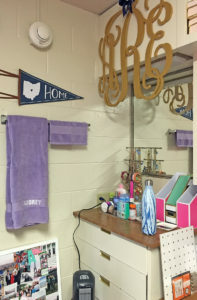 DO find out what the college provides in each dorm room. There was a mini fridge and microwave in her room. However, she had to bring a desk chair and a ladder for the bunkbed. I know…bringing your own desk chair seemed strange to us, also! DO coordinate with your roommate items that can be shared. Audrey brought the Keurig and the rug, and her roommate supplied the curtains. DON’T forget to stock up on Command hooks! They will be your best friend, as you find that they serve a lot of purposes and don’t damage those sacred dorm walls. DO purchase a shower caddy. A great way to keep all your toiletry items together, as you will most likely be sharing a bathroom. DO find out the amount of storage space in the dorm room. This will help you know what to purchase…rolling under bed drawers, containers for shelves, or a storage ottoman are just a few options. DON’T think you won’t need a fan, even if the dorm is air conditioned. A small one near your bed is always nice to have on hand. DO purchase extra lighting. A desk lamp is essential for those late night study sessions. A clip-on lamp is great to have for attaching to your bed, in case your late night studying takes place in bed! A bedrest pillow is so comfortable for late night reading and studying. Finally, and most importantly, DON’T worry if things don’t go as planned! 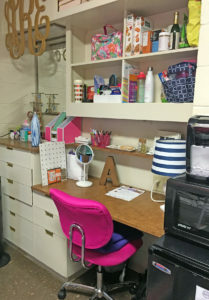 We had Audrey’s first dorm room set up and organized before she began orientation. Yes, I said FIRST because she changed roommates two weeks into the semester…she moved into a different room with a new roommate, so her rug was put in storage and they used her new roommate’s rug. And that bedding that was on backorder? It finally arrived in October! You know what they say about the best laid plans…anyway, it’s better to bring along your flexibility, also. Getting our oldest ready for college seemed like such a monumental task last summer…I’m so glad we are able to relax a bit this year. I hope that my DO’s and DON’TS are helpful to anyone going through this process. My final bit of advice…enjoy that time with your soon-to-be college freshman and happy shopping!